Global foreign direct investment (FDI) flows jumped by 38 per cent to $1,762 billion, their highest level since the global economic and financial crisis of 2008–2009 (figure 1). A surge in cross-border mergers and acquisitions (M&As) to $721 billion, from $432 billion in 2014, was the principal factor behind the global rebound. These acquisitions were partly driven by corporate reconfigurations, including tax inversions. Discounting these large-scale corporate reconfigurations implies a more moderate increase of about 15 per cent in global FDI flows. The value of announced greenfield investment remained at a high level, at $766 billion. Flows to developed economies nearly doubled (up 84 per cent) to $962 billion, up from $522 billion in 2014. Strong growth in inflows was reported in Europe. In the United States FDI almost quadrupled, albeit from a historically low level in 2014. The share of developed economies in world FDI inflows therefore leapt from 41 per cent in 2014 to 55 per cent in 2015 (figure 1), reversing a five-year trend during which developing and transition regions had become the main recipients of global FDI. Much of this shift to developed economies was due to cross-border M&A activity, which recorded a 67 per cent increase in value to $721 billion – the highest level since 2007. Activity was particularly pronounced in the United States where net sales rose from $17 billion in 2014 to $299 billion. Deal making in Europe also rose significantly (up 36 per cent). While FDI through cross-border M&As can contribute to productive investments, a number of deals concluded in 2015 can be attributed to corporate reconfigurations, including tax inversions. This trend was especially apparent in the United States and Europe, with several mega-deals concluded to transfer the tax domicile of an MNE to jurisdictions that offer lower corporate tax rates, and do not levy tax on global earnings. FDI to developing economies – excluding Caribbean financial centres – increased to a new high of $765 billion (up 9 per cent). Developing Asia, with its FDI inflows surpassing half a trillion dollars remained the largest FDI recipient region in the world (figure 2). Developing economies continued to comprise half of the top 10 host economies for FDI flows (figure 3). Following three years of decline, FDI outflows from developed economies increased by 33 per cent to $1.1 trillion. As a result, developed countries accounted for 72 per cent of global FDI outflows in 2015, up from 61 per cent in 2014. This 11 percentage point increase broke the nearly uninterrupted decline that began in 2007. The increase notwithstanding, the level of outward FDI from developed economies remained 40 per cent short of its 2007 peak. Europe became the world’s largest investing region in 2015, with FDI outflows of $576 billion. Foreign investment by North American MNEs, in contrast, remained flat, with a significant gain in Canada being offset by a moderate decline in the United States. 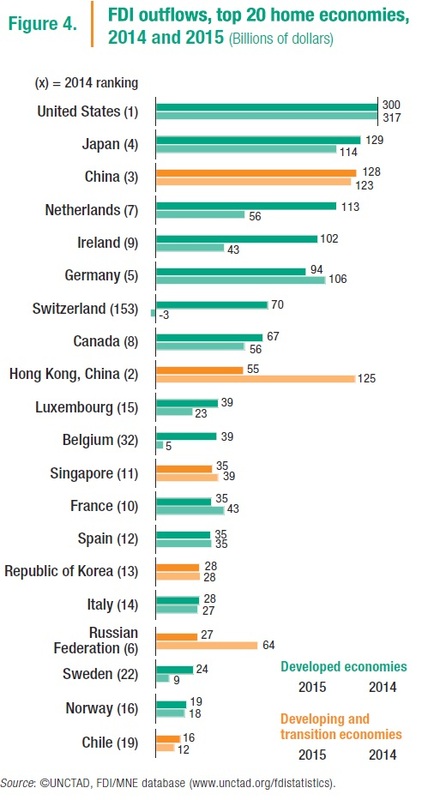 Nevertheless, the United States remains the largest investor in the world, followed by Japan (figure 4). 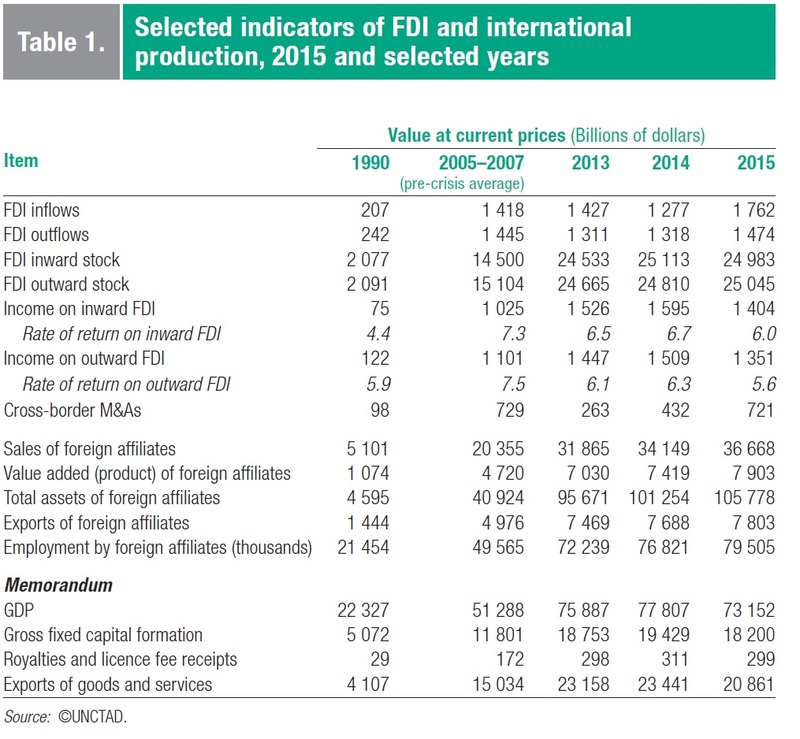 By contrast, FDI outflows declined in most developing and transition regions. A combination of challenges, including declining commodity prices and depreciating national currencies, and geopolitical risks were contributing factors. Against the general downward trend in FDI outflows from developing and transition economies, China was a notable exception: its outward FDI remained high, rising from $123 billion to $128 billion, as a result of which it held its position as the third largest investor in the world. The G20, Transatlantic Trade and Investment Partnership, Asia-Pacific Economic Cooperation, Trans-Pacific Partnership, Regional Comprehensive Economic Partnership and the BRICS account for a significant share of global FDI flows (figure 5). With the exception of the BRICS, intra-group FDI is significant, accounting for some 30 per cent to 63 per cent of inflows in these groups. Although the actual impact on FDI patterns of these overlapping partnerships varies, a majority of MNE executives expect the emergence of mega economic groups to influence their companies’ investment decisions over the next few years. Cross-border M&A sales in manufacturing reached a historical high in absolute terms ($388 billion in 2015), surpassing the previous record set in 2007. This raised the share of manufacturing to more than 50 per cent of cross-border M&As in 2015. FDI in the primary sector, in contrast, suffered from sluggish commodity prices, which resulted not only in reductions in planned capital expenditures but also in a sharp fall in reinvested earnings. At the global level, reduced FDI in extractive industries has affected the total amount of FDI flows, especially in developing countries. 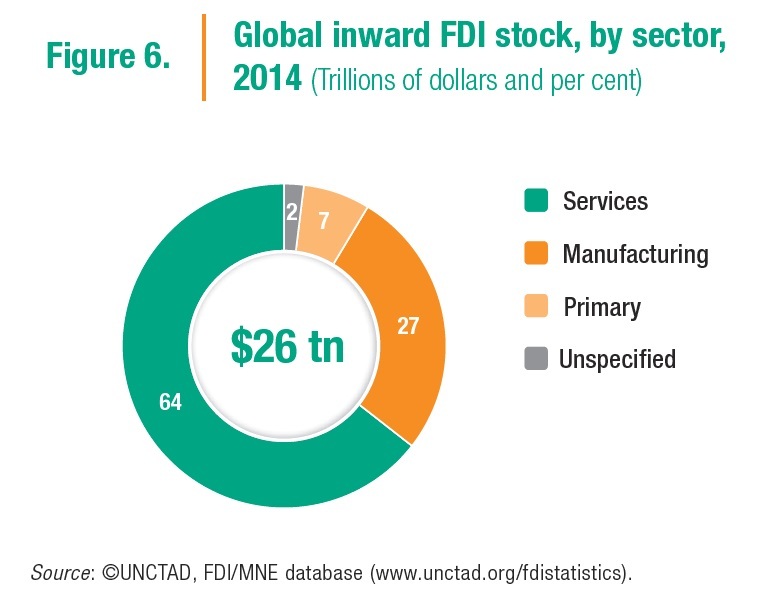 In 2014, the services sector accounted for 64 per cent of the world’s total FDI stock (figure 6). Investment flows to offshore financial hubs – including those to special purpose entities (SPEs) and offshore financial centres – declined in 2015 but remain high (these flows are excluded from UNCTAD’s FDI statistics). The magnitude of quarterly flows through SPEs rose sharply compared with 2014, reaching the levels registered in 2012–2013. Pronounced volatility, with flows swinging from large-scale net investment in the first three quarters to drastic net divestment in the last quarter, tempered the annual total, which dipped to $221 billion. Investment flows to offshore financial centres were down to an estimated $72 billion in 2015, a retreat from their anomalous peak of $132 billion in 2013. They include growing flows from MNEs located in developing and transition economies, sometimes in the form of round-tripping and transit FDI. The proportion of investment income booked in low tax, often offshore, jurisdictions is high despite the slowdown in offshore financial flows. The disconnect between the locations of income generation and productive investment which results in substantial fiscal losses is a key concern for policy makers. The persistence of financial flows routed through offshore financial hubs and the potential fiscal losses due to the disconnect between income generation and productive investment underscore the pressing need to create greater coherence among tax and investment policies at the global level. The international investment and tax policy regimes are both the object of separate reform efforts. Better managing their interactions would help to make them coherent and mutually supportive. UNCTAD has proposed a set of guidelines for coherent international tax and investment policies (WIR15). International production by foreign affiliates of MNEs expanded in 2015. Sales and value added rose by 7.4 per cent and 6.5 per cent, respectively. Employment of foreign affiliates reached 79.5 million (table 1). However, the return on FDI of foreign affiliates in host economies worsened, falling from 6.7 per cent in 2014 to 6.0 per cent in 2015. 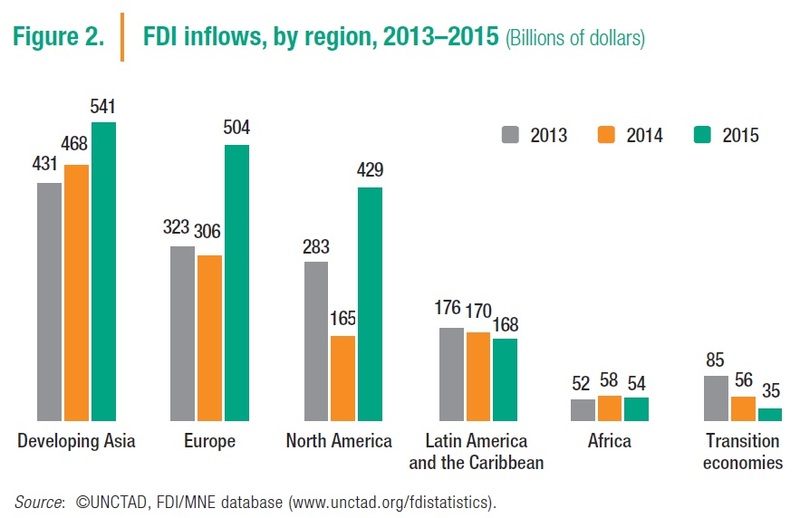 FDI flows are expected to decline in 2016 in both developed and developing economies, barring another wave of cross-border megadeals and corporate reconfigurations. 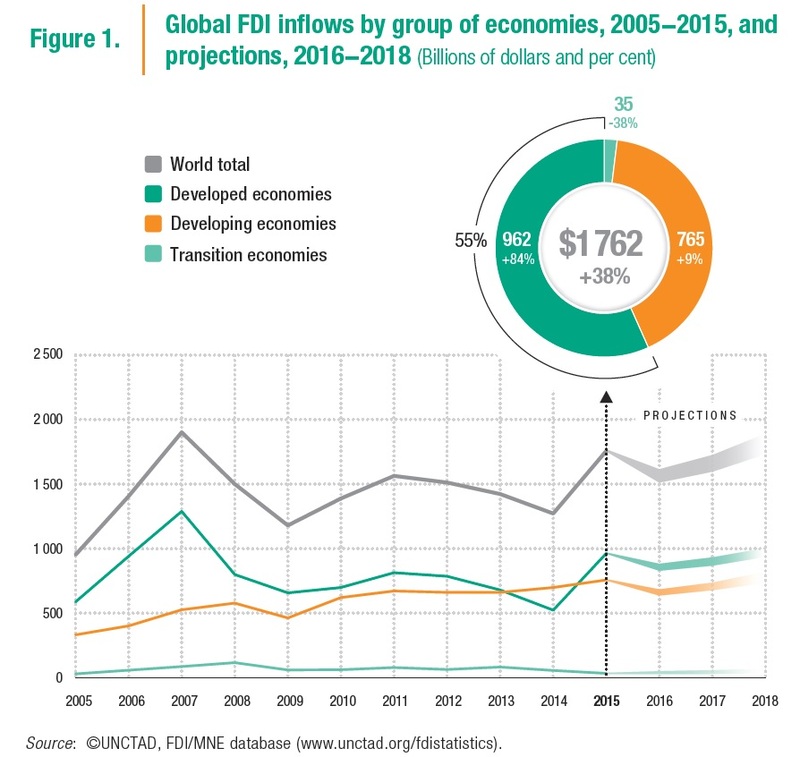 UNCTAD forecasts that FDI flows are likely to contract by 10–15 per cent in 2016, reflecting the fragility of the global economy, the persistent weakness of aggregate demand, sluggish growth in some commodity exporting countries, effective policy measures to curb tax inversion deals and a slump in MNE profits in 2015 to the lowest level since the global economic and financial crisis of 2008–2009. Elevated geopolitical risks and regional tensions could further amplify the expected downturn. Over the medium term, FDI flows are projected to resume growth in 2017 and to surpass $1.8 trillion in 2018. 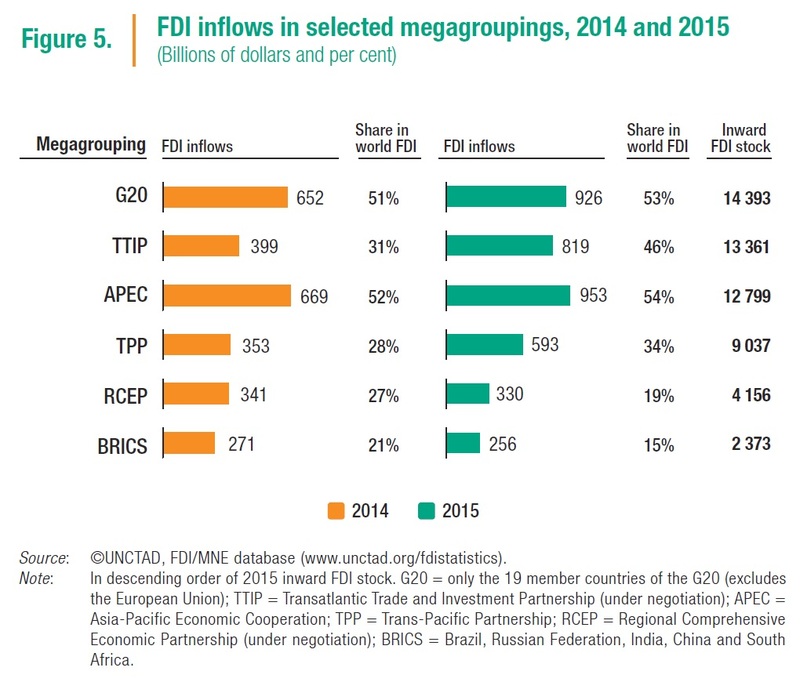 Cross-border M&A activity in early 2016 confirms the projected decline of FDI flows. The value of transactions announced during the first four months (including divestments) was 32 per cent lower than during the same period in 2015. This decline reflects new measures imposed by the United States Treasury Department to rein in corporate inversions, which have already resulted in the cancellation of the $160 billion merger of pharmaceutical company Pfizer (United States) with Ireland-based Allergan Plc. This year’s UNCTAD business survey of MNE executives reveals muted overall expectations for 2016, improving over the following two years. In particular, 45 per cent of top MNEs expect to spend less in 2016, compared with 32 per cent spending more; by 2018 this trend will reverse with 44 per cent expecting to spend more.